The Stitchin Chicks and Iris Thread » Embroidery Talk Has Moved! From the very beginning one of the biggest boosters of EnMart has been a company called Stitchin Chicks. These two wonderful ladies, Penny McClurg and Lynda Morgan, knew of Iris thread before we started selling it, and Stitchin Chicks was one of the first machine embroidery companies to make a major purchase of our thread. They’ve also been one of our biggest boosters at the NNEP Shows where we exhibit. We’ve been very grateful for their support. We also have a serious admiration for their work. One of the best things about selling a product like Iris thread is getting to see the fantastic embroidered garments that those who buy the thread create. 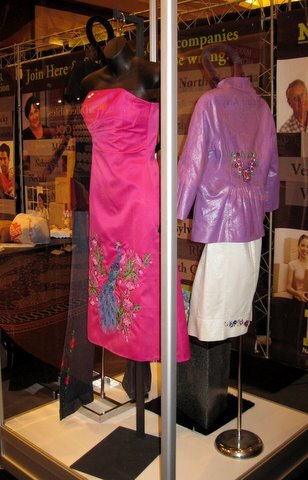 Work done by the Stitchin Chicks was on display this summer at the NNEP Embroidery Marts in Houston and Nashville. We are proud to say that all the work on display, with the exception of the hightop sneakers was sewn with Iris thread. I wanted to share some pictures of their fabulous work with all of you. The design was originally digitized by Hatched in Africa. Lynda edited it. 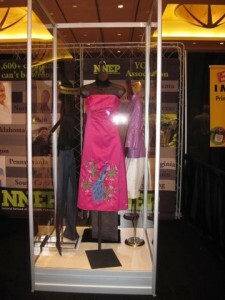 Penny sewed the design with Iris Polyester thread and 350 Swarovski Crystals from Rainbows of Light. The sew out too five hours and applying the crystals took six hours. The design was original digitized by Anita Goodesign and edited by Lynda. Sewn and crystalized with 21 Swarovski Crystals by Penny. It was sewn with Iris Polyester Thread and took 2 hoopings for the skirt and 1 hooping for the jacket. Original Designs by Urban Threads, Anita Goodesign and Embroidery Library. Editing, digitizing and addition changes by Lynda. The jeans had to be unsewn and restitched to hoop. It took about 2 hours to stitch out and 2 sew outs for each leg. Design sewn with Iris Polyester thread and has 100 Swarovski Crystals from Rainbows of Light. It is worth noting that Lynda was in the hospital as a result of chemo associated with breast cancer when most of this work was done. Not only is it fabulous work, but it was done under less than ideal conditions. It should also be noted that all information about the sew outs and materials used was taken from the descriptions of the garments that were handed out at the NNEP shows. 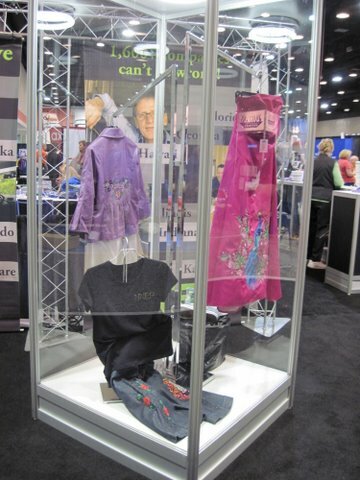 EnMart and Iris Thread are proud to have played a small part in these fabulous garments, and we’re grateful to the Stitchin Chicks for sharing them at the NNEP Shows. This entry was posted on Tuesday, September 28th, 2010 at 10:01 am and is filed under Thread. You can follow any responses to this entry through the RSS 2.0 feed. Both comments and pings are currently closed.